This composite image, with magnified insets, depicts the first laser test by the Chemistry and Camera, or ChemCam, instrument aboard NASA’s Curiosity Mars rover. The test took place on August 19, 2012. NASA's Mars rover Curiosity will use 10 science instruments over the next two years to help characterize the Martian environment and determine if the planet was ever capable of supporting life. 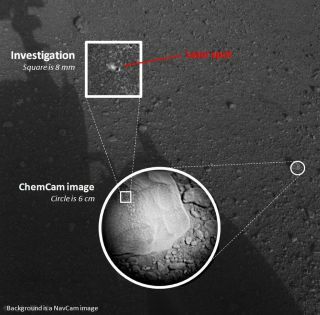 The Chemistry & Camera instrument, or ChemCam, blasts Martian rocks with a laser, determining their composition from the vaporized bits. ChemCam is able to resolve features five to 10 times more in-depth than previous rovers. Astrobiologist Chris McKay, based at NASA's Ames Research Center in Moffett Field, Calif., is part of the ChemCam team. He also works with the Sample Analysis at Mars instrument (SAM), the rover's onboard analytical chemistry lab. In an interview, McKay discusses the Curiosity rover's ambitious $2.5 billion mission — officially known as the Mars Science Laboratory, or MSL — and the role ChemCam and SAM will play. NASA Astrobiologist Chris McKay is part of the ChemCam team. The Atacama desert in Chile is the driest desert in the world, and the Dry Valleys in Antarcticaare the coldest deserts. Since Mars is very cold and very dry, these are very relevant. What kind of results have you had in searching for these organics on Earth? McKay: What we find is that, in every desert on the Earth, no matter how dry or hot or cold, there are organics present. We also find that these organics are present despite the presence of oxidants in the same soil. This suggests that the soils on Mars could have organics even if they had oxidants. That's one reason I'm optimistic that MSL will find organics in the soil on Mars. We know that there are oxidants in the soil on Mars, and people have assumed that they would have destroyed the organics. What we're finding on Earth is that, in a dry soil, the oxidants won't destroy the organics. What do you do specifically on Curiosity's mission? McKay: I'm part of the SAM team, and also part of the ChemCam team. On the SAM team, I'm involved in the analysis of the data — and the same on the ChemCam team — and discussions of what experiments and measurements to make in the future. I'm involved in the scientific analysis. I'm not involved in the technology of the instruments or the calibration of the instruments; I'm involved in the scientific analysis of the results. For example, one thing I'll be involved in is comparing the results of the SAM analysis to what was measured by Viking many years ago on Mars, and to what we have been measuring in deserts on Earth. In terms of ChemCam, one of my interests is how to use the ChemCam laser instrument to select samples for the organic analysis by SAM. I'm a link between those two instruments. I'm involved in all of the instruments on SAM, but my real focus is on the organic analysis of the soil. SAM does a lot of different things. I'll be a little bit involved in all of them, but my real focus and interest is the soil organics. With ChemCam, I'm not sure what we'll be doing. One of the general goals of ChemCam is to select samples for analysis by the other instruments on the rover. In that respect, I'm trying to figure out how we can use ChemCam to select samples for SAM. We're going to learn how to do that as we get more data from ChemCam and more data from SAM. I think how to select samples for SAM using ChemCam will be a learning process. SAM takes very small samples, a cubic centimeter or less. We don't need a lot of dirt or ground-up rock. At this point, we are preparing to collect the first soil samples. So the rover is looking for a suitable soil to collect but we have not yet collected it. How could your work with MSL help to answer astrobiology questions? McKay: The question we want to know is the possibility of life on Mars. The first step is determining water; we've already done that. The next step is searching for organics, and that's the step that MSL is focusing on.